Based on the theory, Law of action and reaction, Strike Industries created a large reflecting area to enlarge great "reaction" to eliminate recoil force. 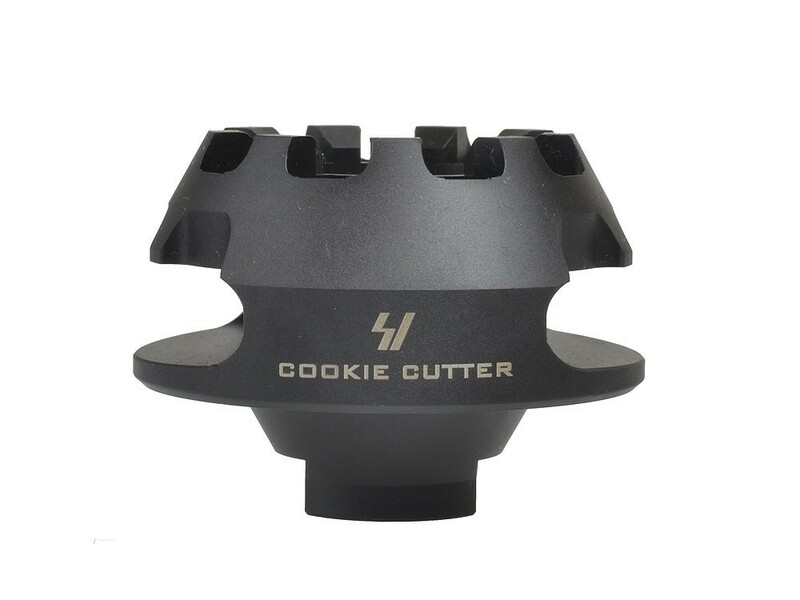 The COOKIE CUTTER COMP is, hands down, the Best muzzle brake for compensating muzzle rise and recoil on Short Barrel Rifles (SBR's) and AR-Pistols. It is NOT a flash suppressor. There will be significant side concussion so the shooter needs to be aware of hand placement and surrounding personnel!!! It is designed as a single chamber muzzle break with a large surface area, which minimizes recoil substantially and at the same time compensates muzzle rise. Additionally the CC-COMP also happens to make a great glass breaker! - 1 x .223 Cookie Cutter Comp. - 1 x .300BKL / 308 Cookie Cutter Comp. -Large Single Gas Port expels gas on both right and left sides. Based on the theory, Law of action and reaction, Strike Industries created a large reflecting area to enlarge great "reaction" to eliminate recoil force. 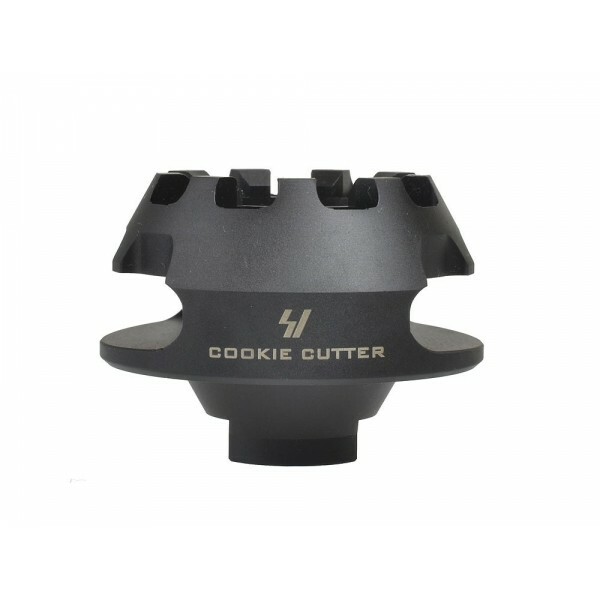 The COOKIE CUTTER COMP is, hands down, the Best muzzle brake for compensating muzzle rise and recoil on Short Barrel Rifles (SBR's) and AR-Pistols. It is NOT a flash suppressor. There will be significant side concussion so the shooter needs to be aware of hand placement and surrounding personnel!!! It is designed as a single chamber muzzle break with a large surface area, which minimizes recoil substantially and at the same time compensates muzzle rise. Additionally the CC-COMP also happens to make a great glass breaker! Product Spec .223/5.56 - O.D. : 2.14” - Weight: 8.11oz - Thread: ½” x 28 - Materials: Steel - Color: Matte Black Product Spec 300BLK / .308 - O.D. 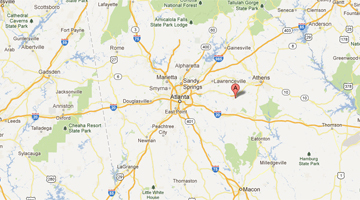 : 2.14” - Weight: 7.90 oz - Thread: ⅝” x 24 - Materials: Steel - Color: Matte Black Package include - 1 x .223 Cookie Cutter Comp. 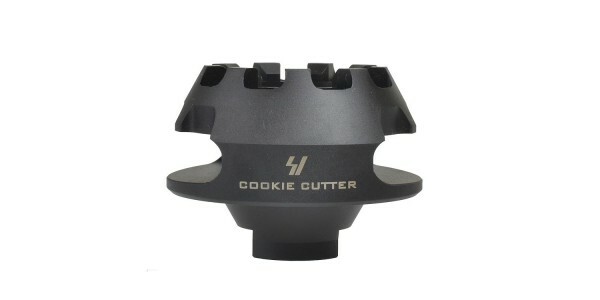 or - 1 x .300BKL / 308 Cookie Cutter Comp. Features -Large Single Gas Port expels gas on both right and left sides. -Heavy-duty parkerized finished steel construction -Unique functional design.